This object was salvaged from the wreck of a trade ship thought to be a Chinese junk, dating to approximately 1725. This corresponds to the reign of the Kangxi emperor (1662-1722) of the Qing dynasty (1644-1911). The wreck was discovered off the Southern coast of Vietnam in 1998 near Ca Mau and is now commonly referred to as the Ca Mau wreck. The ship was loaded with Chinese porcelain of various designs for export to South Asia and Europe. This object is one of a group of 182 pieces of porcelain acquired by the V&A from the wreck. 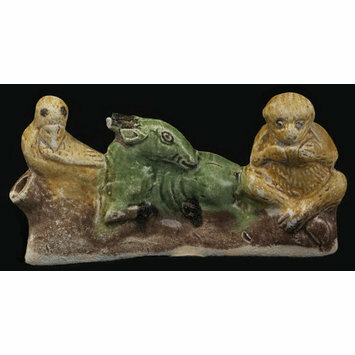 Modelled as a bird an ox and a monkey sitting on a branch with yellow, green and bown glazes. This object was salvaged from the wreck of a trade ship, probably a Chinese junk dating to approximately 1725. This date corresponds to the reign of the Yongzheng emperor (1723-1735) of the Qing dynasty (1644-1911). The wreck was discovered off the Southern coast of Vietnam in 1998 near Ca Mau. The wreck is now commonly referred to as the Ca Mau wreck. By 1999 a total of 51,500 pieces had been recovered form the wreck. It was loaded with Chinese porcelain of various designs for export to South Asia and Europe. This object is one of a group of 182 pieces of porcelain acquired by the V&A from this wreck. These objects were sold through Sotheby's, Amsterdam at sale AM0967 'Made in Imperial China: 76,000 pieces of export porcelain from the Ca Mau shipwreck, Circa 1725' which took place in 2007. Historical significance: This object provides useful information about trade, trade routes, design and markets for Chinese ceramics. The brush rests and water droppers found in the Ca Mau wreck were probably intended for Chinese expatriate communities in Batavia (Jakarta), Indonesia.